Today, we just relaxed around camp and soaked up the sun. We talked to our neighbors, walked around the campground and enjoyed nice, warm weather. What a change from Bryce! Our big excitement of the day...photogaphing the Chucka running around the campground. 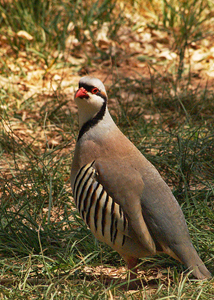 They are masked gray birds with red eyes that run around the campground making clucking sounds. They are a bit strange, but they add interest to the campground.